Ham Radio Stuff | Rolling downhill like a snowball headed for hell! 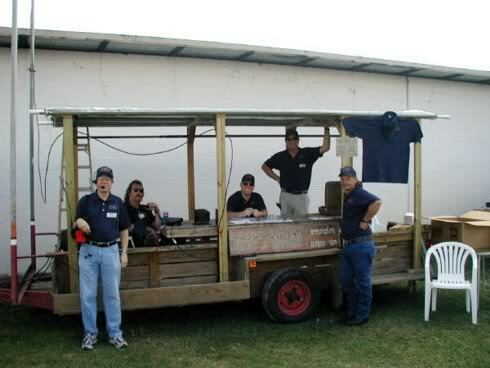 After many meetings and discussions about how to continue building “The Communications Assistance Team Trailer” I gave in and volunteered my assistance as a carpenter and general mechanic. There were many good ideas and designs floating about but no one could agree on what to do or how to pay for it. The toilet was still a topic of discussion so we left it attached until I brought it home to MY backyard where my WIFE quickly solved the problem about the toilet. She informed me if it was still there the next day that my son and I had better plan on using it. We got the gang together, stripped the trailer, pulled the axles, sand-blasted, wire-brushed, Rustoleumed and painted everything, re-built the brakes and started fresh. 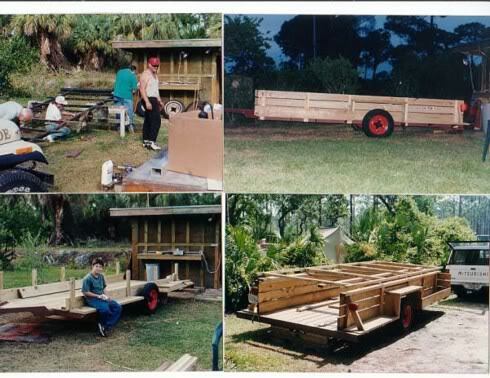 Using some lumber from assorted jobs I had going we managed to design a portable wall and roof design that was friendly to tow and easy, quick to erect on sight. Additions came as time went on and the whole project cost us less than a couple hundred actual dollars. Well, I then volunteered to be the C.A.T. Team E.C. 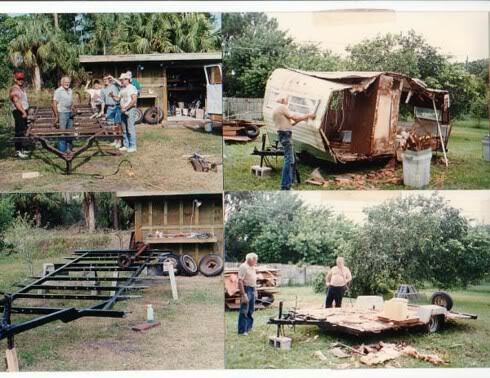 and had to learn what that was all about, contacted Southern Florida Section Emergency Coordinator Jim Goldsberry, KD4GR, SK and learned all about it from him including N.T.S. Messaging. Jim left us right after Christmas 2004 R.I.P. We toured all around South Florida for training drills and used it alot over the years for different events. Never had any problems and have no bad memories I can think of. In this pic you can see the pipe welded to the frame to accept push-up poles for quick antenna installs, when we finally got done it took two people about fifteen minutes to get on-air after arrival on site. 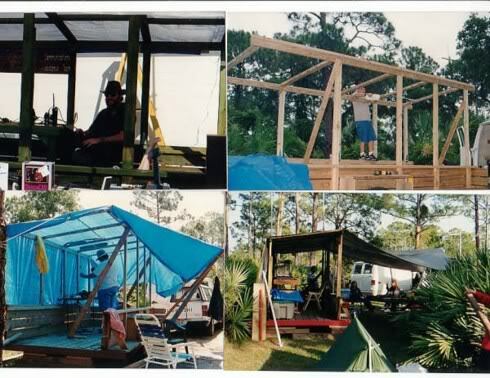 WB8FEW Bobby Pruitt was a mentor of mine years ago, he taught me how to build my 1st antenna, a 1/2 wave 2 meter dipole, quick and easy, excellent for field days, shelter work, emergency communications in general. You can secure a rope with a tie rap on the top leg and toss it over a tree limb, rafters, anything with height inside or out to use. The pvc works good because it’s cheap and durable after you finish and squirt some foam in it. You can use any wire, you can use aluminum tape instead of wire wrapped around the pvc or do the entire job with coax. Feed coax through mast piece of pvc using any desired length, work the elbow over it and glue in place, next slide 6″ piece of pvc into elbow and glue. Leave 3″ of coax extending out, strip 2″ of insulation away, separate the ground shield from the center careful not to let them touch. With the “T” pull the shield through one and the center through the other and slide the “T” into place. Be sure both legs have enough length to work your solder gun, adjust if needed. Remove the “T” and use either a hot glue gun or squirt foam into the 6″ piece of pvc to lock the coax into position, slide the “T” back into place and glue it. Next take 2 20″ pieces of coax OR wire and solder one to each leg, again use hot glue OR squirt foam to secure their place in the “T” connector so they can not slide up or down. Next slide 20″ pieces of pvc over coax, hang it up in the clear and check the swr’s, trim 1/4″ from both legs at a time until you achieve 1.5 @146 mhz. Your final swr will vary a little one way or another depending on how good you soldered and secured everything in place. Glue pvc tubes to the “T”, squirt some foam or hot glue in them and glue some end caps on your’e ready to transmit. Next is a sample of a NTS “RadioGram” message, during emergency events ham operators use this format across the nation to pass messages, very good to know if you plan on helping out. BT (Break) (Signature:) Jane Smith Name of person sending the message. Include the address and phone number if reply requested. Twenty five (25) words is not a rule but rather a “benchmark” so the messages can be as concise as possible. – It’s not a letter…or a book. The 5th item of information required in the preamble of a National Traffic System (NTS) message is called the check. The check it simply a count of the words in the body of the message. It is used as a rudimentary error detection device. Each station that receives the message #- and there may be several between origination and delivery will count the words and compare the count with the check in the preamble. An accurate count does not guarantee that the message has been received correctly, but an inaccurate count is a sure indicator that something has gone wrong. The check counts only the words in the body of the message. It does not include the preamble. It does not include the address or phone number. It does not include the signature. It does, however, include the closing words of the message: Words like; sincerely yours, 73s and 88s, love, and so on. Words that our English teachers used to call the “complimentary close” are counted in the check. You’ll find examples of how to count the check in The ARRL Handbook, The ARRL Operating Manual, and The SEFTN Traffic Handler’s Guide. Some words are ambiguous, particularly when spoken on phone. Single Sideband, for example might be counted as 2 or 3 words, depending upon how you write “Side-band.” Words like “wavelength” and “feedline” present a similar problem. The sending station ought to clarify the count of the message by volunteering how he counted the more ambiguous words. It helps if the sending operator tries to consider the problems that the receiving operator might have with the text. Count words the way you usually see them in print. That’s a good indicator of what people are accustomed to seeing. Any given message may be handled with a variety of modes. A message starting out on Phone may be taken cross country on CW and completed on Packet. This tells us that the check must be counted the same, no matter what mode is utilized. A multi-digit number counts as one word if sent with numeric characters. For example 73 or 1994 each count as one word. If spelled out, the words are counted individually. F-I-F-T-Y S-I-X is 2 words. Nineteen ninety four spelled out is 3 words, not 4. 5 digit ZIP codes are counted as one word. Nine digit, ZIP+4 codes are two words. Canadian postal codes are 2 words. 10 digit telephone numbers count three words; 7 digit telephone numbers count two. Initials are counted as words: “DAVID EDWARD SMITH” and “D　E　SMITH” are both three words. Vacuum tubes and solid state device numbers like 1N34A, 6JB6, 6146B or 2N3394 are counted as one word. Likewise, Amateur callsigns sent as alphanumerics like W1AW, or KB5XYZ are one word. This is true even if the callsign contains a slash character like VE1ABC/W4, or W4/LU1AB, or N5XYZ/AE. Non-essential punctuation is omitted from messages. However, it is sometimes necessary to send punctuation in order to keep the message understandable. The word “QUERY” replaces the question mark. We omit periods, colons, semicolons, and commas. Essential divisions between ideas are made with the letter “X,” vocalized as “X-RAY” on phone. Each “X-RAY” or “QUERY” counts as a word in the check. Packet radio port numbers and addresses often contain a “DASH” or an “AT.” These are words in their own right, and must be counted as such. “K4XY AT W4XYZ” and “KB4ABC DASH SEVEN” each contain 3 words. In the Amateur Service, prudent message handlers use words rather than exotic symbols like the dollar sign or parenthesis. “Figure group 45　D-O-L-L-A-R-S” counts as 2 words. A decimal point does not separate a number into 2 words. For example “146.79” is one word. All of the digits in an expression of time are counted as one word. For example 6:15 or 0730 is one word. AM or PM counts as another word. The time zone abbreviation EST, EDT, GMT, Zulu, or whatever counts as yet another word. However, by convention Greenwich Mean Time, GMT, Universal Coordinated Time, UTC, and Zulu time may be sent in 24 hour time format with the letter “Z” appended. That is 4 digits and a “Z,” like 0715Z or 2235Z, all sent together, and counted as one word. If the time zone is sent as individual words, those words are counted normally. Eastern Daylight Saving Time, for example, is counted as 4 words. ARRL numbered Radiograms are always counted as though the numbers were spelled out. For example, “ARL FIFTY SEVEN is counted as three words; ARL is the first, 50 (F-I-F-T-Y) is the second, and 7 (S-E-V-E-N) is the third. The letters “ARL” are prefixed to the word count in the check. On voice it is relatively easy to clarify the check of a message. The originator can point out how he counted the more obviously ambiguous words, or re-read the message 5 words at a time at reading speed. On CW, the Q　signal “QTB?” asks, “Do you agree with my count of the check?” If the receiving station does not agree, he can send “QTB-K” (w/o　? ), prompting the sender to transmit the first letter of each word in the text. The sending station can volunteer to do the same, announcing his intention with the signal “QTB” (again, w/o　?). Make sure the word count is correct before “rogering” the message. The check is a valuable device for insuring the accuracy of message transmission. Occasionally we run into a little difficulty getting the count straight. But with a little bit of the cooperation for which hams are so well known, it does work. It’s hard to find your posts in google. I found it on 12 spot, you should build quality backlinks , it will help you to increase traffic.